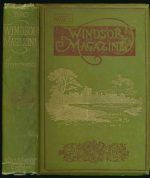 Ward, Lock & Co., Limited, 1896. Contains 'The three correspondents, by Arthur Conan Doyle, and 'Dr. Conan Doyle and his stories' by Archibald Cromwell.